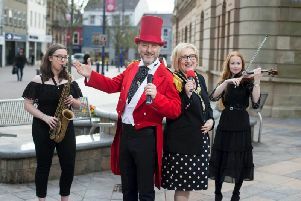 Sir Kenneth Branagh was in Belfast on Sunday, to showcase his new movie Cinderella at a charity premiere in his home town. And the director and actor was in buoyant mood in advance of the much-anticipated red carpet screening of the latest adaptation of the familiar fairy tale. Sir Ken provided some fascinating insights into the process. He read in the part of the prince, when he was auditioning Lily James for Cinderella. Then she had to audition with mice – appropriately enough for Disney. “Yes, we had a special mouse camera unit, a little docudrama, to see how Lily coped with all that, even though we would be using computer-animated mice in the movie. “She has a genuine youthfulness and freshness, but also a toughness from working on Downton Abbey (where she plays Lady Rose) and has seen the top folk like Dame Maggie Smith doing it. It was all part of the process to scoop one of the most high-profile parts in the world for the young actress. Now she’s firmly on the road to becoming a new worldwide star. For lots of little girls of all ages, Lily will forever be Cinderella, in crystal slippers and a fabulous sky blue silk ball gown, twinkling with stardust and travelling in a golden carriage, with lizard footmen. And he dismisses any suggestion that she would have been very proud of him and his high profile in Hollywood these days. And the really exciting news for those who think Sir Kenneth Branagh has deserted his love of the bard is that he’s bringing his young Cinderella co-stars to the London stage, to cast Lily James and Scot Richard Madden (Game of Thrones), who plays the Prince, as the “star-crossed” lovers in Romeo and Juliet in London’s West End next year. • Cinderella – certificate U – is on general release from Friday.